Yes, I have an obsession with ribbon. And yes, I’m always trying to think of new ways to store it. A while ago, I figured it out here. The only problem is that I kept buying ribbon, but I didn’t keep storing it properly. 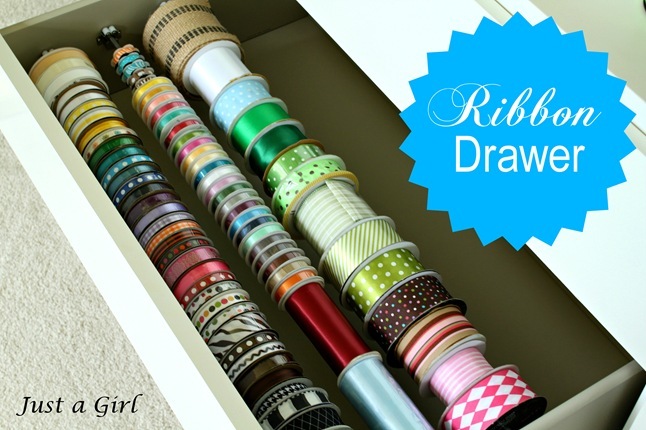 I keep all my ribbon in a drawer in my craft room, but it was starting to pile up (literally). Since I had the space, I figured out a way to make the ribbon more accessible and more compact. In my head, I knew what I wanted. I just wasn’t sure I’d be able to find it. After walking around Lowes for 30 minutes, and my husband saying, “It just doesn’t exist”, I. found. it. Redemption! 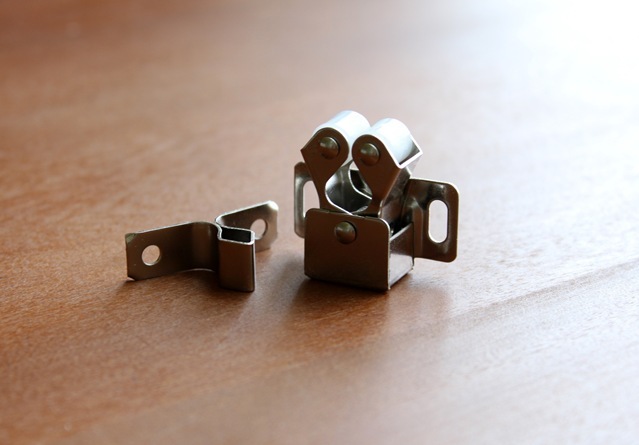 These little cabinet clamps were .91 cents, but they felt like a million bucks at this point. They can be found right where all the decorative handles/knobs are for cabinets. They’re down below. Ask a Lowes employee if you struggle finding it! I measured it out (loosely), so they would be spaced apart enough. I pre-drilled some holes and screwed them in. I used a wood dowel as my template, but I bought little metal rods for the final product. The weight of the spools is just too much for the wood dowel. I think the metal ones ran about $2-ish. My handy-man husband used a hack saw to trim them down, and they popped right in! If I wasn’t so lazy, I’d count how many spools are hanging there, but I am. And there’s a lot. I still use my old storage system for scrap ribbon or spools that are near the end. Thankfully, Lowes could see the vision in my head and had exactly what I wanted! Easy, compact, inexpensive? Check, check, check! What a clever idea, thanks for sharing! You bet, Allie! Thank you! This is such a great idea! I have an old medicine cabinet that I’m thinking of turning into ribbon storage…sometime. Perfect, Allyson! That’d be an awesome idea! Good luck! Can you give some direction as to where we find the cabinet clamps at Lowes? Were the metal rods hard to cut or did they cut them for you at the store? Yes!! 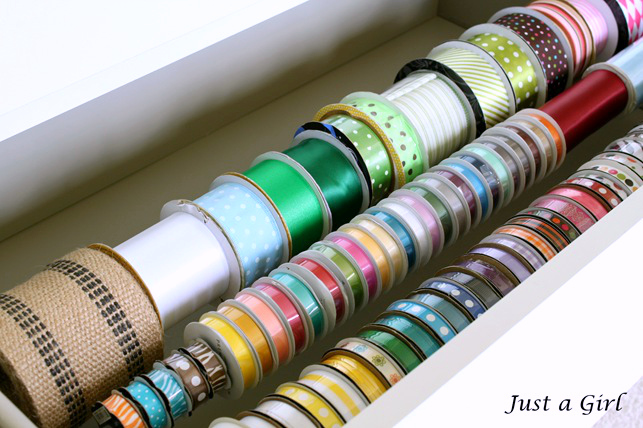 Finally a really simple way to make one of these ribbon storage things! The “bought ones” are phenomenally expensive (like, ridiculous money! ); thought of using Ikea’s wire curtain hangers (the kind that have tensioners either end and are designed for those clips-with-rings, which hold a voile/lace panel)…. but wasn’t sure where to attach them; thought of dowels, but wasn’t sure how to fix them… Now I know what to do! And thanks for the hint about using metal rods, instead of wooden. Really, you’ve done all the hard work for us already! I’m glad I could help, LizzieMade! I hope it works out for you! What a great idea!!! I’ve just started to make hair bows for my daughter and am already running out of room. I think I”ll have to try this out – now if I can just find a drawer to use:) Thanks for the great tip! Jessica, that’s the same mistake I made. I started making hair bows, and the ribbon got out of control! Thank you! That’s awesome!! Can you tell us what they’re called or where in the store we can find them!! I have a new craft room just begging for these!!! I’m afraid I don’t know what they’re called, but they are located right with all the other decorative knobs/pulls. They were with the other hardware pieces. Good luck! 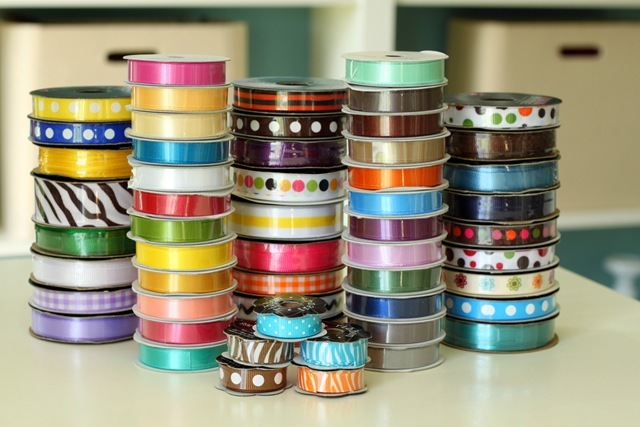 I was JUST thinking about organizing my craft supplies and I kept having a mental block at storing ribbon! I have a whole dresser to use, so this is perfect!! Well, there you go. Perhaps I subconsciously knew you were having a mental block? Good luck! LOVE! As much as I love ribbon, I suffer from the same ribbon storing issues, and this is a fantastic idea! Now my wheels are spinning at other possible uses for that fantastic gadget find! Ha! Well let me know what else you come up with! Thanks, Jenny! What a great setup! How did you cut the metal rods to make them fit to the right size? And what gauge of rod did you use? Sorry to be the one with all the annoying questions! I believe I said in the post, but–my husband just used a hack saw for them. Cut right through. I’m afraid I don’t know what gauge. He cut it before I could check. They’re in the same aisle as the clamps, so you could just see which ones fit! Good luck!! Great idea! Thanks for sharing. Just curious you said you used “A LOT” of ribbon. What do you use it all for? Scrapbooking? Oddly enough, Liz, I don’t scrapbook. I use it for everything under the sun. I mostly use it for wrapping presents (the only kind of ribbon I use), my daughter’s hair bows, decorative trim on candles, etc. I think my problem is that I might figure out a way to use it, and I won’t have it! Great Idea! You could actually use a drawer or if not that a wooden box or something … perhaps even add castors….just in case your ribbon is not close enough to your wrapping center. Love it. Great idea, Becky! I didn’t even include all my Christmas ribbon. That would definitely work for that! Smarty pants. Super cleaver idea. Mine are a jumbled mess in two plastic bins. I love this AND it looks pretty. Bonus. Yes, key words: for now. 🙂 Good luck! Brilliant of course! 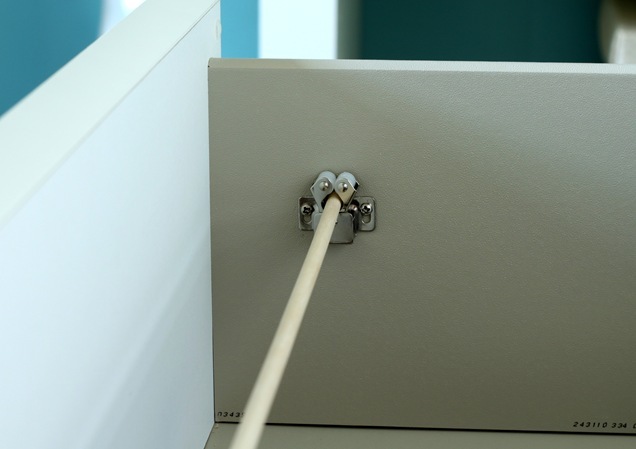 Did you try or think about the expandable, spring loaded little curtain rods? Mine are thrown into a basket, so don’t ask me? Ha! Yes, I did Barbara. I was afraid that they would keep slipping around if the spools were too heavy. Good idea! PERFECT! What a great idea. I rack my brain constantly for ribbon storage. Did the dowels, didn’t work for me (wood) too weak. Larry made a ribbon holder didn’t work. Now I have those craft drawers I bought when I was shopping with you at Ikea remember? I would have never thought of those Lowes hardware pieces. Your a genius….Good post, good idea. Thanks from your mom. What a great idea! 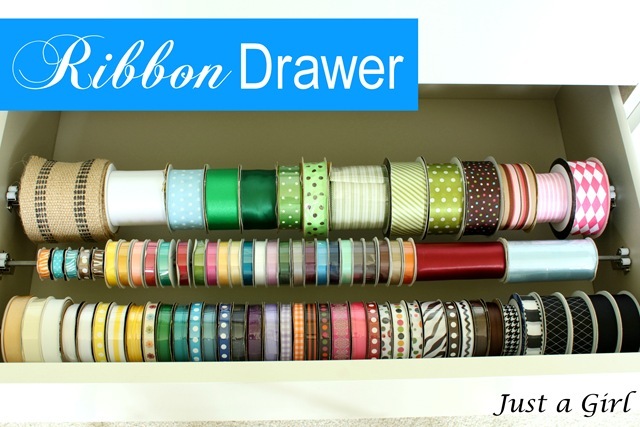 If you have tons of ribbon like this, you need something to keep it all organized and so the rolls are going everywhere! So pretty! Well that’s a bummer, Stefanie. 🙁 There are lots of other ways to store ribbon–maybe another solution will work for you? Good luck!